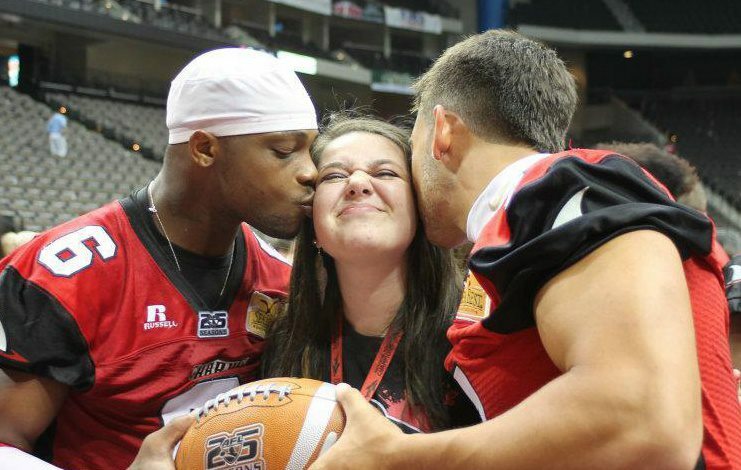 This picture was taken after a Jacksonville Sharks game in 2012. At the time I worked for the team and knew most of the players pretty well. After a long night of greeting fans and answering their questions, working group raffles, and running around the arena looking for people I just wanted some one-on-one time with the two players I had "adopted" as my own. My family has season tickets to the Sharks and sit really close to the players, and by really close I mean the second row from the field, two seats to the right from the player bench. In arena football if a fan catches a football at any point during the game, they get to keep it, which is really cool (but if a player flies into their lap they can't keep the player- bummer!). I went down to say hey to my family and I found out they had caught a football, and I told them I would take it down onto the field after the game since I had post-game access before any of the fans to get the football signed by the team. The team was just starting to come out of the locker room and I immediately went to the most popular players, knowing that after fans were let down on the field, there was no way I was going to get to those players. After congratulating these players on their big win and having them sign the football, fans were allowed on the field. My mom ended up coming down because she knew I had to get a picture with two very special players and I can't take a picture with the front facing camera on my phone to save my life. After waiting in line for what seemed like forever I finally got to the two players I have loved since the first time I went to a Sharks game almost three years ago. The first player was #6 Laroche Jackson, but everyone calls him LJ. Right next to him, sits #7 Marco Capozzoli. When both of them signed the ball I realized I didn't have a picture of all three of us together, which in my mind was a tragedy. So knowing I had a staff pass and could get behind the tables where the players sat I walked back told the guys for the picture I needed a kiss and BOOM!, this picture happened. Needless to say there were a ton of people around the table at that moment and I'm sure some of the girls were jealous that I had just been kissed by two football players at the same time. For me, this picture isn't all about the kisses or what some called "preferential treatment" by these two players, but it was that I had built a relationship with them and it was something for me to look back on and say this was a moment I shared with these men that no one else will ever get. Fast forward to 2013. The Sharks have started a new season, and I have taken plenty of pictures since this one, but none of them are as special. This picture will probably never be recreated due to the fact that LJ has been assigned to a new team in the AFL (the Cleveland Gladiators) and Marco now sits between two members of the Sharks dance team. To some this picture might just be a picture of some girl with two football players, but to me it's a memory that will last forever because these are my boys.